Some people might think orbs are just dust particles on a camera lens, but I am here to tell you different. I have always believed in the afterlife, ghosts, angels, and spirit, for as long as I can remember. It wasn't until the end of 2003 when a friend of mind e-mailed me a photo of an old cemetery that had an orb over one of the tombstones (.....that I became interested in orbs as a psychic phenomenon). As soon as I saw this photo I became so excited because I knew right away what it was. I enlarged the picture to get a better look at it, and then found that there was yet another orb over another tombstone further away in the distance. I thought, "How cool is that?" " I should go out and take some pictures myself." But then there was snow on the ground I couldn't go. The holidays came and went. It was now January of 2004 and I still couldn't get that picture of the orbs out of my mind. I wanted to go take a picture at a cemetery to see for myself if I could do this, but with the white snow on the ground it would be almost impossible to see a white orb over tombstones covered in snow. I became anxious so I decided to do research on line about orbs and that is when I stumbled onto a web page where I read these words; "Some of my best orb photos' were taken in my own home." I said to myself "In my own home?" You mean I don't have to go to a cemetery to take a picture of a spirit? I had my camera on my desk right by me as I read those words. I picked up the camera, and just turned around in my chair and took a picture. To my wonderful shock and surprise there was my very first orb! Oh it was a bright one too. It had a bluish center and white around the edges. I quickly downloaded it onto my computer and sent it to the women from the web page that I read about taking pictures in your home. She responded rather quickly too, that very same day, and told me "Congratulations you indeed have a picture of a orb!" In this second half, Marinette shares how she began her journey of learning how to take pictures of orbs with a regular camera in her own home. 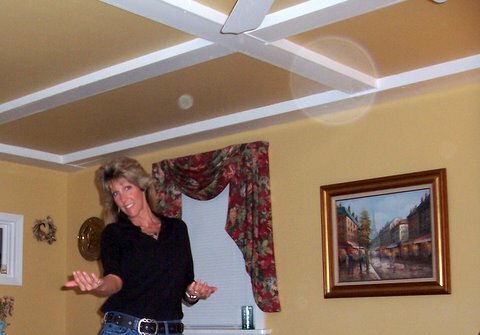 Just as Marinette did, you may also be able to capture the image of spirit orbs in your home. 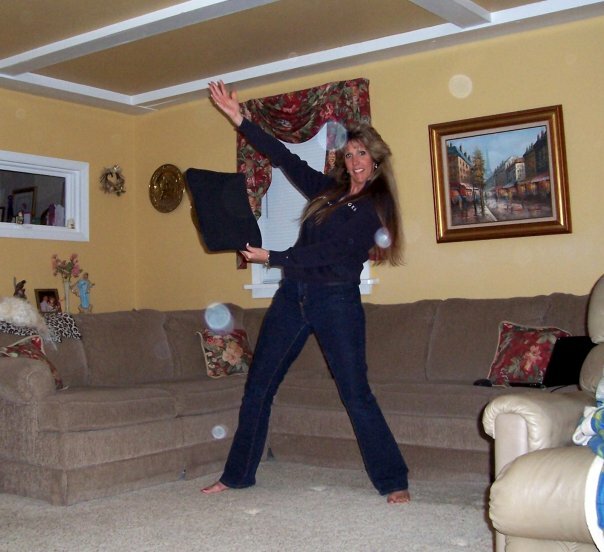 Visit her website for more pictures of orbs and information. I went from one orb in a picture, to three orbs, then five and then the numbers kept growing. I've used many different cameras too. I also started getting different colors, and then different shapes. Some orbs if you look real closely you can almost see wings inside them or even a face. I was totally amazed. I then started randomly taking pictures of people at work to show and see who was around them, and it seemed everyone had something [orbs] around them. I started doing experiments and having people or myself think or say out loud the names of someone that has passed and then take the picture. To my amazement and theirs, there it was. I'll never forget the first time I tried this on a woman that her husband recently passed away. I took her picture and the orb was right over her heart! I was happy to show her the picture and tell her that her late husband was showing her how much he loved her by landing on her heart. Everything happened so quickly for me. I realized that if I am going to be doing this, I better make sure that people understand that the orbs are in charge and I am only the messenger. What if I take a picture of someone and they have no orbs around them? All I want to do is help people. I didn't want to make them feel bad. I prayed on it and I then decided that I'd have a three-picture maximum. I explained to everyone that if nothing shows up by the third picture, then it wasn't meant to be at that time. I found that when people were afraid they seemed to not show up in the pictures until they were ready for it. They definitely respond to emotions, good ones, happy ones, and occasionally when I'm sad they come for comfort. They always show up for special events or holidays. Lets face it; this whole Orb thing isn't just a coincidence. There is something to this. I think that Orbs are Spirits, Balls of energy [which is what we are made of,] and our Angels & guides around us. They communicate with me and they can with you by the pictures we take. They keep showing me new things all the time. I can now sense them around me more often and sometimes I see flashes of light, which has me running to get my camera. Isn't it wonderful to know we are truly never alone? LIKE US ON OUR FACEBOOK FAN PAGE.